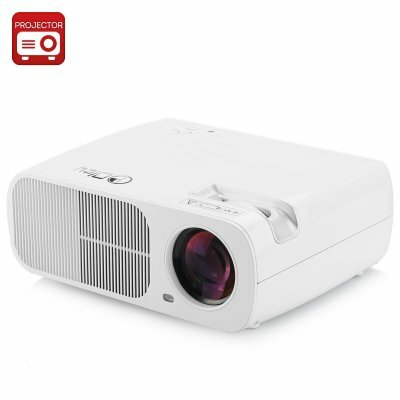 Successfully Added 5 Inch TFT LCD LED Projector 'Saturn' - 2600 Lumens, 800x 480 Resolution, 1080p Support, Manual Focus Lens (White) to your Shopping Cart. This 5 Inch TFT LCD LED Projector emits 2600 Lumens, has a 800x480 Resolution with 1080p Support and Manual Focus Lens. Video projectors are widely used for many applications such as, conference room presentations, classroom training, home theatre and concerts. This projector uses LED light as they provide the best lighting and also they have an extremely long lifespan of about 20,000 hours of use. An incredible approach to see all your media and presentations in a large screen easily viewble format is by utilizing this powerful projector that has been made with a 5 inch LCD board that has a dpi standard resolution of 800x480; however it is capable of supporting 1080p format files. 2600 lumens is exactly what you get with this projector a making it great for connecting your TV box or video game console and then bringing the content to life and can easily be viewed in lit venues. Watch all your media in full quality as is projects a screen size of between 32 to 200 inches from a distance that is between 1.2 and 6 meters making it ideal to use at home, in the office or in the classroom. With a contrast ratio of 2000:1 in addition to displaying in both 4:3 and 16:9 aspects and the ability to use a 360 degree picture flip, this projector is a definitive approach for appreciating media. This product is in stock now, we guarantee next working day shipping and offer a 12 months warranty on all our products. Brought to you by the leader in electronic devices as well as wholesale video projectors, Chinavasion. It looks beautiful. Great buy for the price. very easy to use. Hint: instead of buying projector screen, you can use a pull down window shade. Basically the same but over a 100$ saved. Courtesy of a home depot employee.